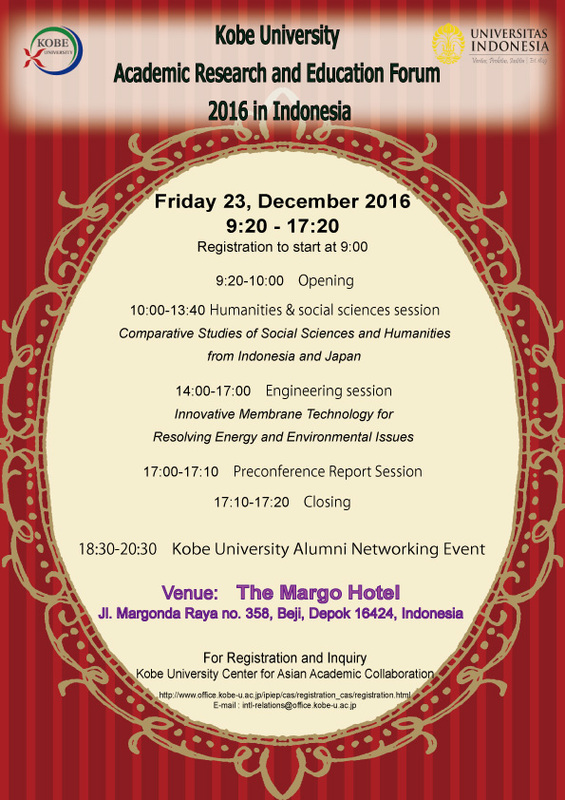 We are pleased to inform you that the first Kobe University Academic Research and Education Forum (KUAREF) in Indonesia, “Language, law and technology: Research Frontiers between Kobe University and Universitas Indonesia" will be held on December 23, 2016 at the Margo Hotel. This forum originally started as the Kobe University Global-Link Forum (KUGL) in 2011 in Bangkok, Thailand. This year we will focus more on the research and education aspects, and accordingly we have changed the name of the symposium to the Kobe University Academic Research and Education Forum (KUAREF). This year we will hold a memorable first symposium under the theme of “Language, law and technology: Research Frontiers between Kobe University and Universitas Indonesia”. The morning session will focus on humanities and social sciences and the afternoon session will focus on engineering. We look forward to your participation in the forum. Please register using the Registration Form. Remarks: To avoid spambots, we put a space before "ac.jp," so please delete the space when you email us. © Kobe University. All Rights Reserved.